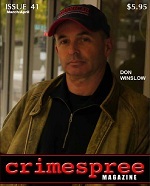 The cover story of 41st issue of Crimespree Magazine is an interview with Don Winslow by Jeremy Lynch. There’s great short fiction by Sean Monaghan and Gay Degani. Article contributors include, among others, Dave Zeltserman, Libby Fischer Hellman, Reed Farrel Coleman and Craig McDonald. You also get outstanding book, DVD and comic reviews.